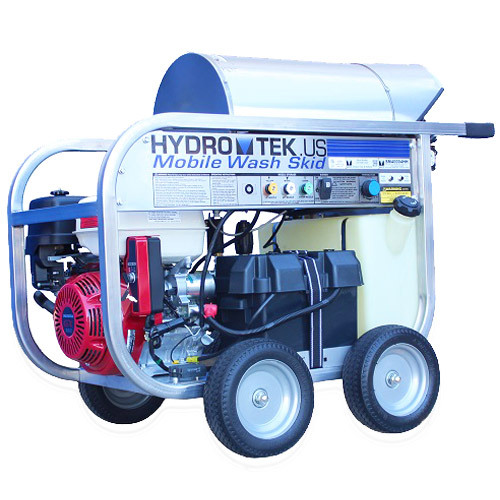 Hydro Tek SM Series Hot Water Pressure Washer is a portable gas engine pressure washer. It is powered by a gas engine and ready for use wherever a water source is available. No electricity is required. With a SpiraLast coil and 12v burner you will quickly and efficiently heat water to effectively blast away grease and grime. The SM Series includes airless tires to eliminate flats on a jobsite and is easy to maneuver with the integrated handles. Stainless panel, coil enclosure, and rain guard are rust resistant and keep your machine looking great for years. The SM Series is a value conscious choice in hot water pressure washers without sacrificing performance, features, and operator safety. Hydro Tek’s 1¼”, heavy gauge steel frame is durable for rough terrain and has integrated handles for maneuverability. Ask your local distributor about a FREE stainless steel frame upgrade. These rugged and durable panels offer lifetime rust and corrosion resistance and keeps your machine looking like new for years to come. Lighted rocker switch, adjustable thermostat, and other controls are located on an easy to reach panel. Includes panel mounted, resettable circuit breakers to protect the electrical system of your pressure washer. These single cylinder, air cooled, commercial Honda engines are fuel efficient and easy to start. Electric start engine on SM40004HH, Pull start engine on SM30003HH. The open design allows for quick access to all components for fast refueling and periodic maintenance. The Honda engine powered wash skid has an integrated unleaded gasoline tank. The burner diesel tank is a heavy duty “roto-molded” rust free tank with fuel filter to protect against contaminated diesel fuel. The unloader is separate from the pump, nonintegrated, eliminating heat failure and vibration. The coil is a Hydro Tek manufactured SpiraLast™ heating coil. Robotically fused ½” schedule 80 steel pipe is cold rolled to protect the steel pipe from fatigue and the spiral coil is then surrounded by ceramic insulation and a stainless enclosure with double-wall end caps. Ask your dealer about the Lifetime Coil Warranty. The SM Series comes standard with four airless tires for moving the machine right to your wash site. Maneuver through glass, nails and other sharp job site objects worry & flat free. PowerLight ignitor, provides maximum burner performance. No outside power source is required. These industrial triplex, ceramic plunger pumps for a long life of industrial duty use. Burst disc technology for operator safety, adjustable temperature up to 250ºF, heavy duty wand/gun, snap lid battery box, 50’ high pressure hose, and quick release nozzles.